Scienceware® Lab-Aire II Non-Electric Wallmount Dryers keep labware up off the bench and out of the way as it dries. Easily installs on walls or standard pegboard using molded-in tabs with key hole openings. 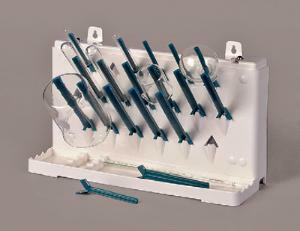 Small (3"), medium (4") and large (5") pegs can be moved and repositioned to hold a variety of labware including beakers, flasks, bottles, test tubes and cylinders. Drip/storage trays have scalloped wells to hold long thin labware. Rugged ABS plastic will never corrode and easily wipes clean. Single-tier model can also sit on benchtop. Ordering information: Extra accessory pegs are available to create a fully customizable drying system. Pegs measuring 3" (89050-352), 4" (89050-354), and 5" (89050-356) are available separately.